News coverage of President Donald Trump reads like a dystopian novel such as “The Hunger Games,” with a threatening leader seeking to restrict news and information. But it’s all too real, which is why proposed net-neutrality rollbacks must be resisted. RECENT news coverage of the Trump administration is as thrilling as “The Hunger Games” or any other dystopian novel. There’s the threatening leader, seeking to restrict news and information, so he can keep a tight leash on the citizenry and do as he pleases. He’s enabled by sycophants and hypocrites leading Congress. Heroes include the capital press corps. Reduced in numbers and facing uncertain futures, they are still able to pull back the curtain and show how the public is being misled. Submit comments at FCC.gov on the proposed net-neutrality rollback. Refer to Docket No. 17-108. They’re helped by patriots inside the White House bravely trying to save the republic by revealing the menace it faces. This is not a book or a movie, though. It’s an immersive history lesson and adventure in civics. Americans are learning again the value of their nation’s founding principles, the importance of an engaged citizenry and the role of a free press. “There can be no stronger proof that knowledge is power and that ignorance is weakness,” Thomas Jefferson wrote two centuries ago, in one of his letters referencing this belief. Trump’s whiny attacks on the press, veiled First Amendment threats and roughing-up of reporters covering his administration and rallies are just the start. More devious are the administration’s efforts to reverse policies that ensure information is freely available, without restriction, via the internet. 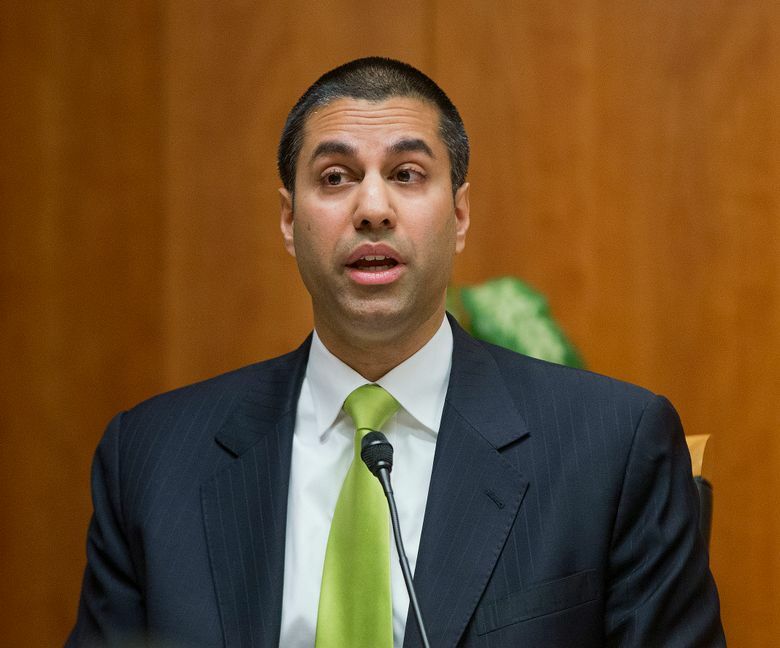 Trump’s chairman of the Federal Communications Commission, Ajit Pai, is moving quickly to end these “net-neutrality” protections. They are designed to prevent throttling and other interference with the distribution of digital media and information. The FCC approved net neutrality rules in 2015 after decades of debate and legal fights over whether and how to regulate internet service. The solution that met muster, and drew unprecedented support from millions of citizens, was to treat broadband as an essential public utility. This enabled light regulation, to prevent broadband providers from giving preferential treatment to any particular content. The internet is now America’s primary source of knowledge. It’s a universal platform for news and information, as well as the backbone of commerce and communication. Yet broadband access is dominated by relatively few companies. It’s critical that these gatekeepers don’t manipulate, restrict or prioritize information based on its content. While companies such as Comcast and Verizon profess support for open internet principles, they have fought bitterly against regulations enabling enforcement. Arguments by Pai that net-neutrality regulation has hindered investment by these companies are weak. Capital spending on broadband naturally slowed as networks were built out, the business cycle matured and companies spent heavily on acquisitions. Providers such as Comcast also found ways to upgrade networks at lower cost, with software that boosted speeds. Broadband companies also invested heavily in content companies in recent years, as part of a broader consolidation in the media industry. This limits knowledge by reducing the number of sources of news and information, and options for receiving it. Seattle is familiar with the downside of media consolidation. Local TV stations are greatly diminished after a series of mergers, including the sale of KOMO to Sinclair Broadcast Group. Sinclair helped sway the election for Trump. His son-in-law, Jared Kushner, revealed in December that the Trump campaign cut a deal with Sinclair to provide access and coverage before the election, according to a Politico report. Sinclair also forced its stations to broadcast segments favorable to Trump, prompting pushback from the KOMO newsroom. Now Sinclair is buying Tribune Media in a deal that will extend its reach to more than 70 percent of U.S. households, if approved by regulators. Congress restricts any operator from covering more than 39 percent of the country, to ensure a diversity of media, but the Trump team is enabling a way around. In April, Pai pushed through a change in the way stations calculate their market coverage, enabling them to have a larger footprint. Two weeks later Sinclair bought Tribune. Join the more than 2 million people who have already submitted comments at FCC.gov on docket item 17-108.